Third-grade student Jazzlyn Remly said, "Dear board members, Please don't close my school. Love, Jazzlyn." For more than two hours, supporters of the small independent school district that has 215 students shared stories about how some students were able to thrive in the smaller environment, away from the larger districts like Campbell County. Two speakers supported the merger. One grandmother, who has custody of six grandchildren after the death of their mother, said that two of those kids couldn't speak at one time, and credited Silver Grove teachers with being able to help those kids learn to communicate verbally. Older students spoke of the district as if it were a family, expressing uncertainty about how they would cope with its closure. Teachers pleaded with the board, arguing that reaching the students and helping them feel safe meant more than test scores. But test scores at the district - among the lowest in all of Kentucky - along with a difficult tax rate and small enrollment, motivated voters last fall to bring change to the district, even if that meant the ultimate change, a merger. Four incumbent board members lost their seats. The only returning board member, Melanie Pelle, was in the middle of her four-year term and was able to sit out the election. She was the lone vote against the merger in a 4-1 vote. Monday's vote followed a preliminary meeting a week earlier in the same place where board members considered terms of a merger with the county system. 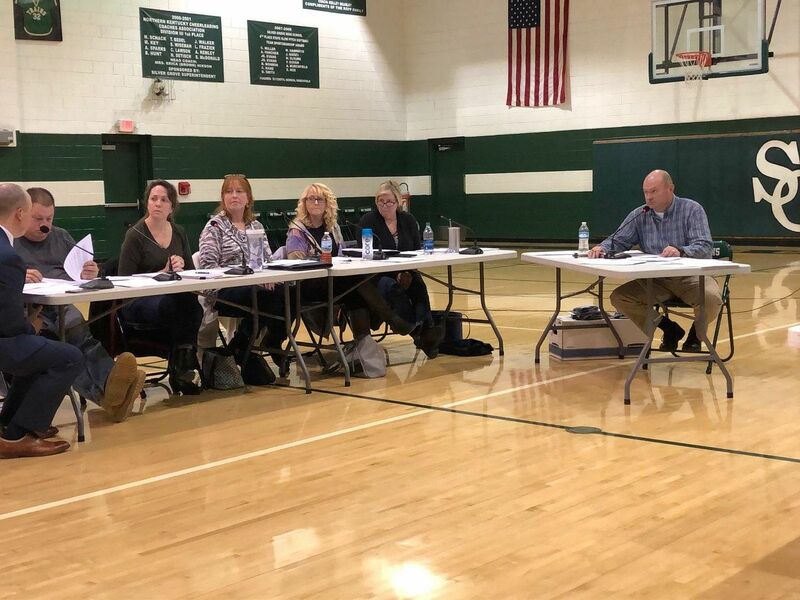 One condition that the Silver Grove board wanted to make was that its district's faculty and staff be guaranteed interviews at Campbell County. But Campbell County wants unfettered control of the merger and declined the offer. On April 15, Silver Grove Superintendent Dennis Maines will distribute non-renewal slips to all faculty and staff, including himself. Pelle was joined by board members Jennifer Wade and Paul Hehman in voting to ask again for interviews of Silver Grove staff. Board members Kathryn Dee and Tonya McCarty opposed the request. Board attorney Zach Lotspeich told its members that the request could be a deal-breaker with Campbell County. A merger agreement still requires approval from the Campbell County board of education, which will assume responsibility over all assets belonging to Silver Grove, including its school buildings, technology, classroom materials, and vehicles. Items that Campbell County doesn't want are the historic and athletic memorabilia, like the banners celebrating past sports championships hanging as a backdrop to Monday night's emotional meeting. Those will need to be stored elsewhere. Last week, the school board discussed the possibility of asking for storage space at the city building. After the meeting, when asked for a statement, Superintendent Maines said his opinion doesn't matter. "With all due respect, you know the desires of the board," he said. "There's really not a lot I'm going to be able to say." With the merger agreement, if approved at the county, the Silver Grove board members will resign their seats and the Campbell County board of education will take over governance of schools attended by Silver Grove children, and will also set the tax rate. Pelle plans to stand firm. She said that she has a legal right to stay on the board for the remaining two years of her term and intends to do so.